As Massachusetts prepares for state special elections on April 1, Wellesley commences its own Election Week on campus, with students meeting those campaigning for positions of campus leadership, hearing them debate important College issues, and participating in the college’s storied tradition of democratically-elected student leadership. There are eight positions open: College Government President, Vice-President, Chief Justice (who oversees the Honor Code), Student Bursar (oversees the budget for student programming), the Director of On-Campus Affairs or DOOCA (who leads the Schneider Board of Governors), the Multicultural Affairs Coordinator (who leads the Community Action Network to promote a culture of diversity), the Chair for the Committee of Political and Legislative Action or CPLA Chair (who oversees the College’s non-partisan activism group), and the Chair of Finance & Communication. Also up for student vote are the Ballot Initiatives, proposals for programs to improve campus life. The proposal with the most votes will receive $11,000 from the college. Current CG President Joy Das emphasizes how vital the debates are for elections. “The debates are the major way CG candidates present their platforms and perspectives to the student body, and it's also the best way for students to get to know the candidates,” she says. College Government makes wide-ranging decisions about the life of the College, and every student has the right to shape the government through her vote. To learn more, check out the elections committee website or Facebook page, and submit a question for the candidates. You can also email the election committee at elections-committee-2014@wellesley.edu. Election Day Party: April 8, 10 p.m. Thanks to Wellesley College Archives we know this about the 1937 photo: Miss Katherine Forsyth of Ben Avon, Pa., newly-elected president of the College Government Association, tries on the footgear of Nancy Jane Miller of Baltimore, who is retiring from that office. In the background old and new major officers look on. 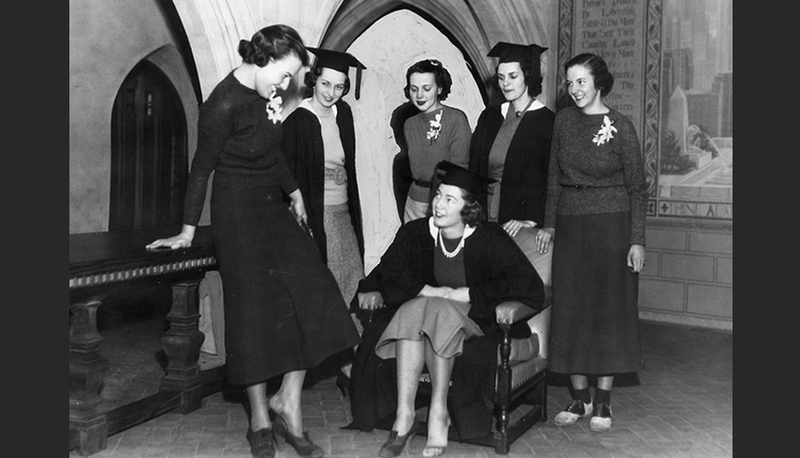 Left to right: Katherine Forsyth '38; Marion Wolff '37, Philadelphia, retiring business manager of Barn; Catherine Parker '38, Oxford, N.Y., new Chief Justice of Superior Court; Nancy Jane Miller '37 (seated); Hope Buckner '37, Yonkers, N.Y., retiring chairman of House Presidents' Council; Edar von L. Fleming '38, Bethesda, Md., new chairman of House Presidents' Council.